“Golden boy Ezra Faulkner believes everyone has a tragedy waiting for them—a single encounter after which everything that really matters will happen. His particular tragedy waited until he was primed to lose it all: in one spectacular night, a reckless driver shatters Ezra’s knee, his athletic career, and his social life. After months of staring at this book on my shelf, I finally decided to read it. I’ve been wanting to read this novel for quite a while, but up until now I kept getting distracted by other books. I wanted to wait until I was relaxed and I could fully enjoy the story, and summer vacation is the perfect time for just that. Let me tell you, it was certainly worth the wait! I knew I would adore this book as soon as I started reading it- everything just clicked into place for me. The whole book has a very John Green-esque feel to it, and I couldn’t help but be sucked into the story. Personally, my timing for reading this novel was perfect. Just like Ezra, the main character, I’m going into my senior year of high school in the fall. Perhaps that’s why I connected so easily to these characters. Or maybe it’s just Robyn Schneider’s superb writing skills. The character development in this novel is outstanding, particularly concerning Ezra. Not only did significant change in his views and perspective occur, but it took place gradually throughout the entire novel. People in real life don’t often wake up one day and suddenly feel like a whole new person. Change generally takes time, which can be difficult to portray in a single book. However, the character development here was executed so well that I couldn’t help but smile inside (and outside!) at the end. Was the ending like the happily-ever-after ones that you find in fairy tales? Definitely not. Did it make my heart ache a bit? Yup. But I felt as though it was the logical path for the characters to take. It felt natural instead of forced, and I think that’s one of the most important qualities for an ending to have. This book is filled with little references to all things nerdy- Doctor Who, Harry Potter, the list goes on and on. I loved how Robyn Schneider incorporates real interests into a fictional world. Ezra’s quirky group of outsider friends are amazing, and yearned to join them on all their exciting adventures. They are funny, dynamic, and interesting characters that are still realistic enough to have been real people in actual life. Overall, I adored The Beginning of Everything. If you’re looking for a fun, thought-provoking, quirky read, I highly suggest picking this one up! Have you ever read this book before? What were your thoughts on it? Let me know in the comments section below! 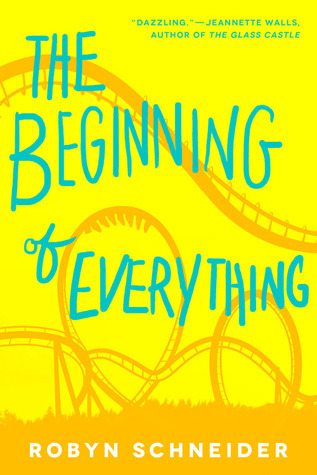 Everyone comparing this book to John Green makes me want to read it, but for some reason books where the characters are obviously named after an author just bug me, I don’t know why. Your review makes it sound so good though, so I’m sure I’ll give it a try!